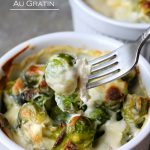 Brussel Sprouts Au Gratin takes the classic most hated veggie of all time and drowns it in a delicious cheese sauce making it a yummy side dish that is hard to hate! Brussel Sprouts are that classic veggie you either love or hate. I’ve grown to love them as an adult. If you are going to try any vegetable for the first time (or the first time as an adult) what better way to try it than smothered in a cheese sauce. Au gratin is the way to go. In this au gratin I’ve added some ground mustard and onion powder for a little added flavor, and I’ve gone with cream cheese instead of that traditional mayo. You can use mayo instead of cream cheese, of course, but I prefer the cream cheese. It adds a thicker, creamier element that is just so delicious. Let those veggies bathe in cheese sauce and go au gratin style. It’s delicious! What is au gratin sauce? Au Gratin refers to a popular cooking method where something is topped off with seasoned bread crumbs and a cheese sauce and then browned. Is it Brussels sprouts or brussel sprouts? They are named after the city in Belgium so they are in fact Brussels sprouts with a capital B and an s at the end of each word. Sprouts is also correct because it is the plural, signifying there is more than one. You most often see it as brussel sprouts which is simply a very common misspelling. It is spelled “brussel” in Flemish so it is correct somewhere, but it has just become a very common misspelling which makes it widely accepted and more often searched for than brussels sprouts. PRO TIP: If you want the brussel sprouts to retain a bright green color, place them in boiling water for 1 to 2 minutes to shock them, and then drain. Then use in the recipe as directed. Preheat oven to 350 degrees. Lightly grease a 2-quart (8x8) casserole dish with nonstick cooking spray. In a medium-size saucepan, melt butter over medium heat. Whisk in flour to form a roux. Whisk in mustard, onion powder, and salt. When the paste is warm and bubbly, pour in milk. Heat until mixture thickens. Remove from heat and stir in cream cheese and parmesan cheese until melted and smooth. Place the trimmed brussel sprouts in the prepared pan (Note: if your brussel sprouts are large you may need to cut them in half so they are bite-sized). Pour cheese mixture over brussel sprouts. 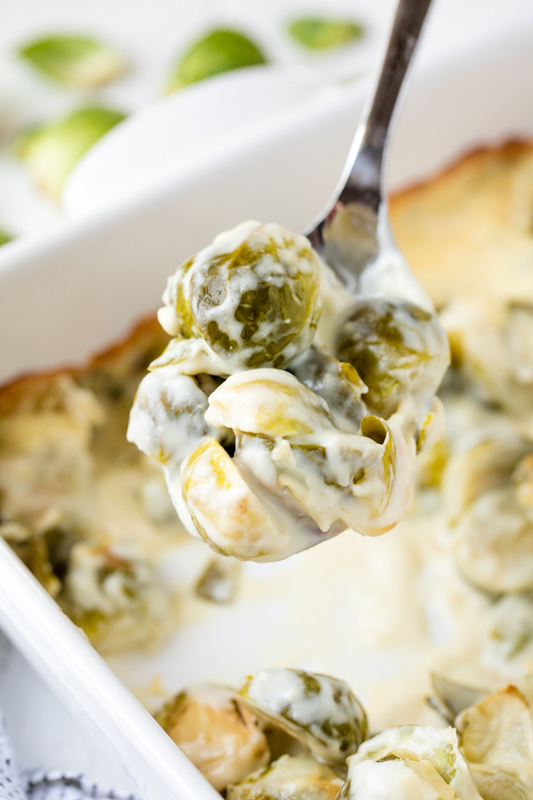 Bake in the preheated oven for 45 minutes to 1 hour, until brussel sprouts are soft. I made this recipe and while my husband, son and I liked it 2 of our girls did not. They prefer my oven roasted with garlic and olive oil. That being Saturday d I’m definitely going to be making this for Thanksgiving this year! The Brussel Sprouts were done to perfection not mushy at all. I agree with the suggestion of adding bacon 🥓 😃. 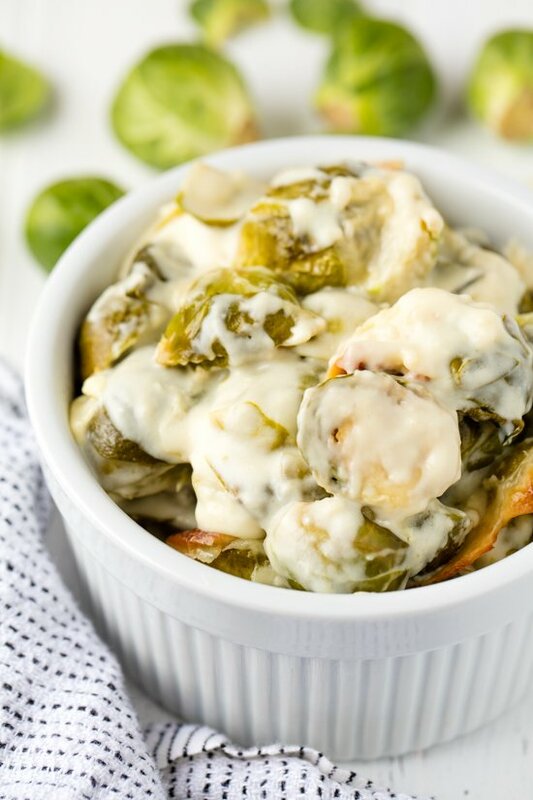 I'm normally not a huge fan of brussels sprouts, but this recipe will definitely get me to try them again. Thanks for sharing! You definitly need to add bacon to this recipe to make it complete. 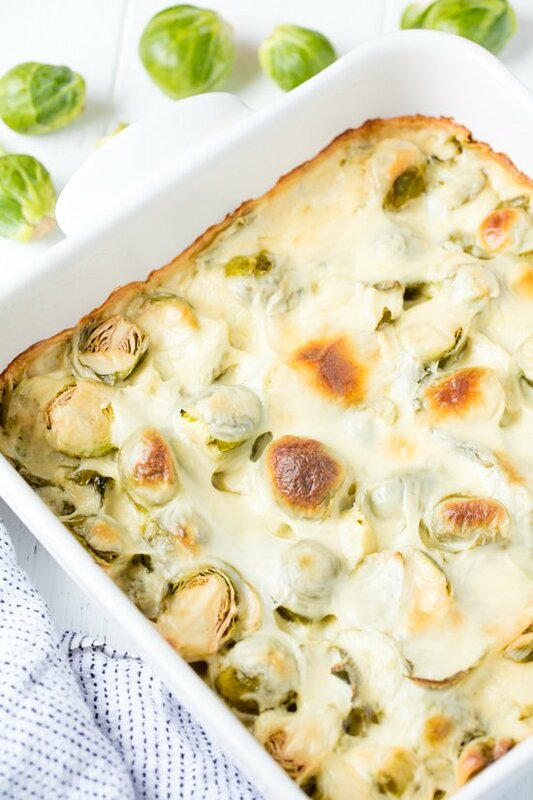 Okay, it's so funny that you posted this recipe today, because I actually had been looking at brussel sprout gratin recipes a few weeks ago. This reminded me that I need to make it!